"Disney Examiner" photo reduced from way big to 35 percent for your purpose. Think we have enough although at least one of the paddlewheel would be nice too. 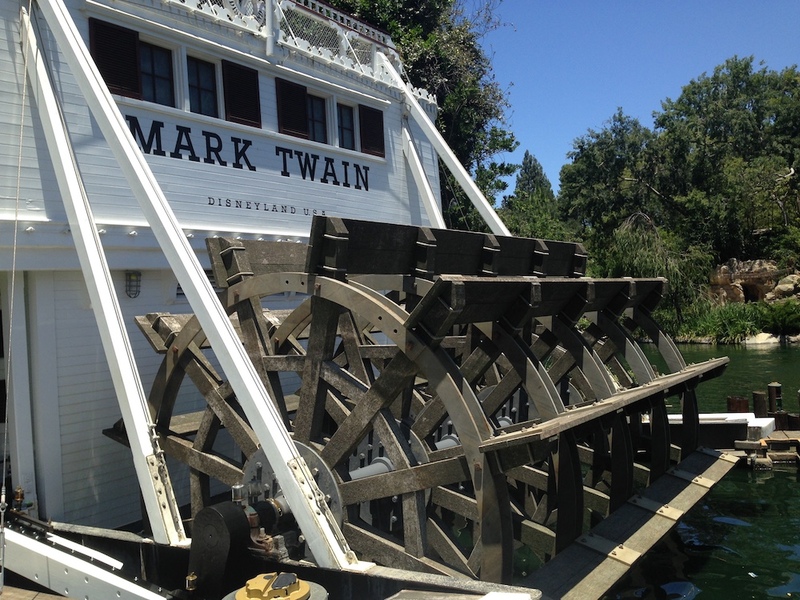 The MARK TWAIN that on the Rivers of America at Euro Disneyland near Paris, France. Copyright DLRPmagic. 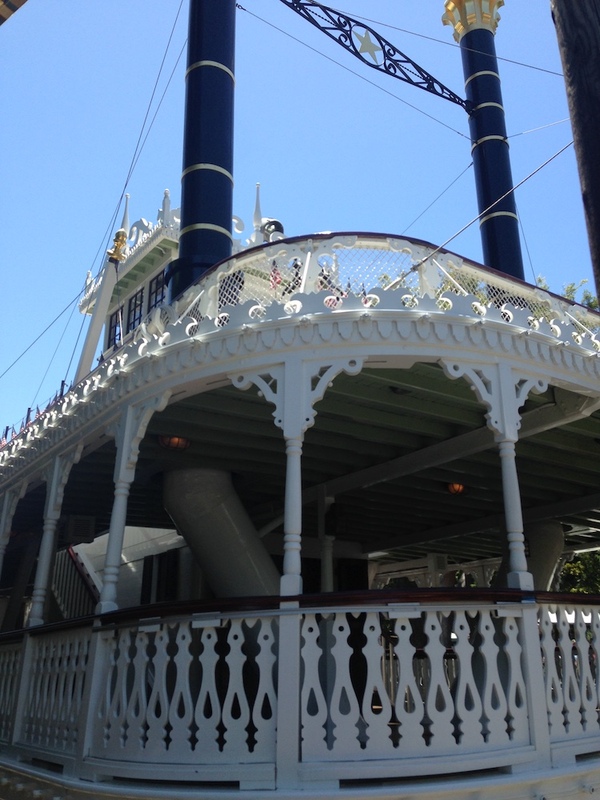 This version of the steamboat differs in that the paddlewheel is painted red as were most of the steamboats on the Western Rivers, while the original MARK TWAIN at Disneyland in Anaheim is wood with spar varnish on it, no paint. 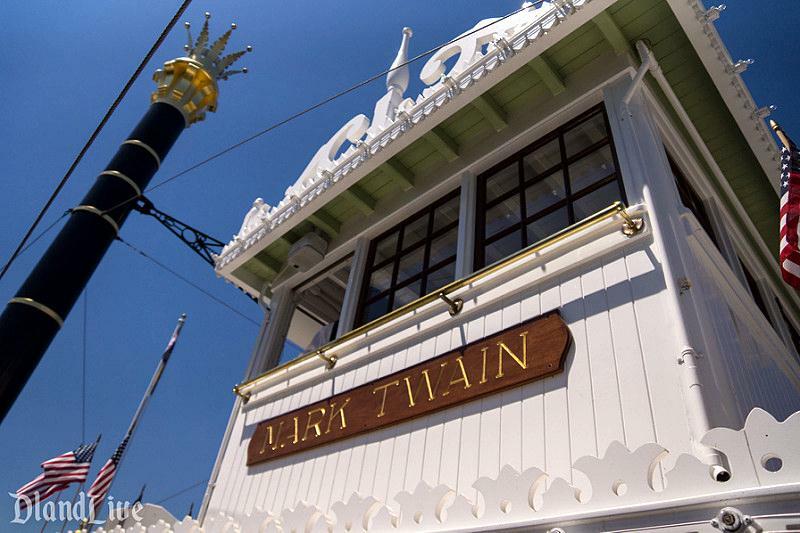 Above the sternwheel at the stern is a name board with the name MARK TWAIN instead of the name being painted directly on the bulkhead. Also two maritime style lanterns are attached to either side of the the name board, probably to illuminate it after dark. 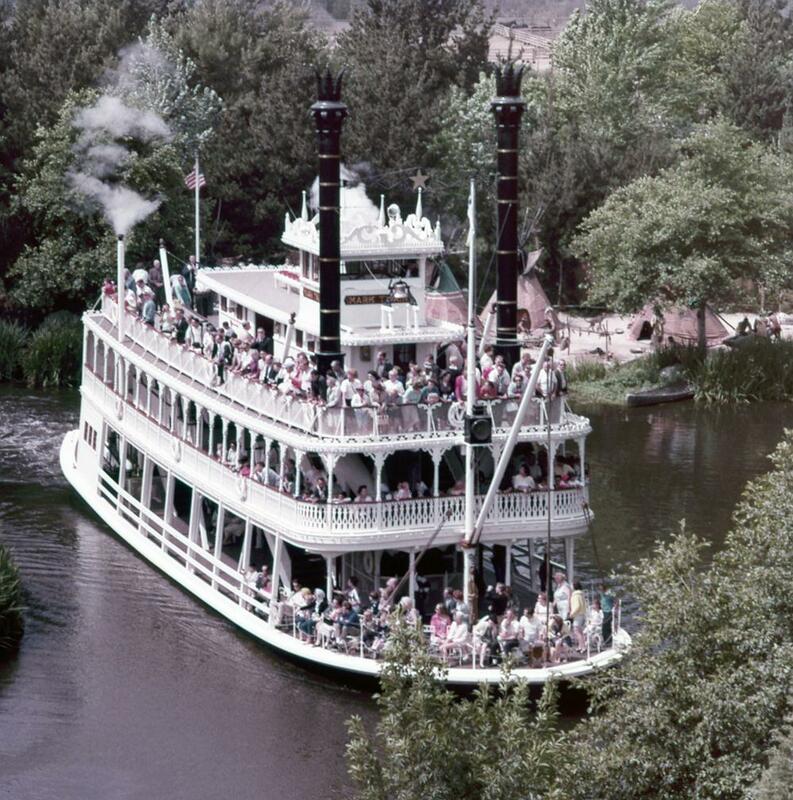 1 1/2 inch square color slide of the MARK TWAIN at Disneyland from the 1960's was taken from a high vantage point, probably from near the top of one of the craggy promontories on Tom Sawyer Island in the middle of the Rivers of America. 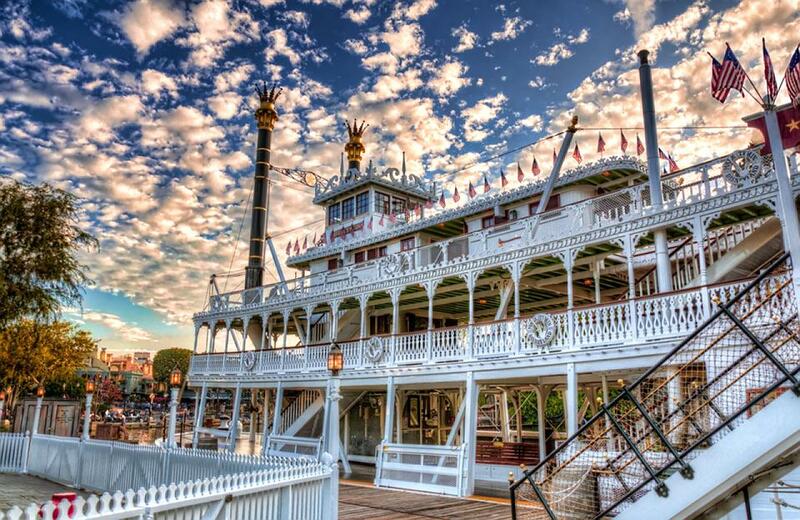 Because the MARK TWAIN was the first functional paddlewheeler built in the United States in fifty years, the Disney designers conducted extensive research to construct it like riverboats were built in the heyday of steam powered ships. The decks were assembled at the Disney Studios at Burbank, California while the 105-foot hull was constructed at Todd Shipyards, Los Angeles Division, San Pedro, California. 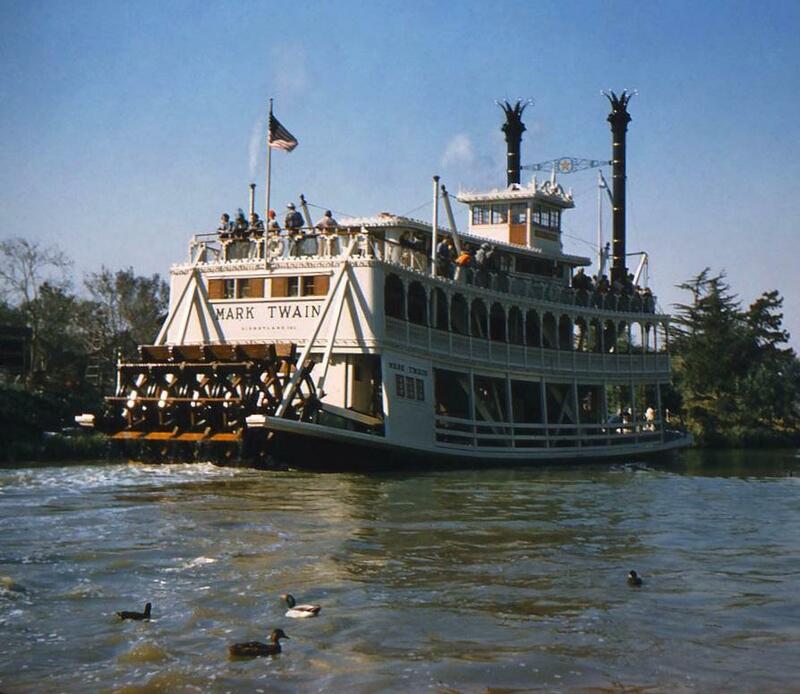 The MARK TWAIN had her maiden voyage on July 13, 1955, four days before the park officially opened, for a private party celebrating Walt and Lillian Disney's 30th wedding anniversary. As the boat traversed its sparsely vegetated river route with 500 passengers, it came loose from its track and got stuck in the muddy banks. Immediately, the park established a maximum capacity of 300 passengers, which remains in effect today. 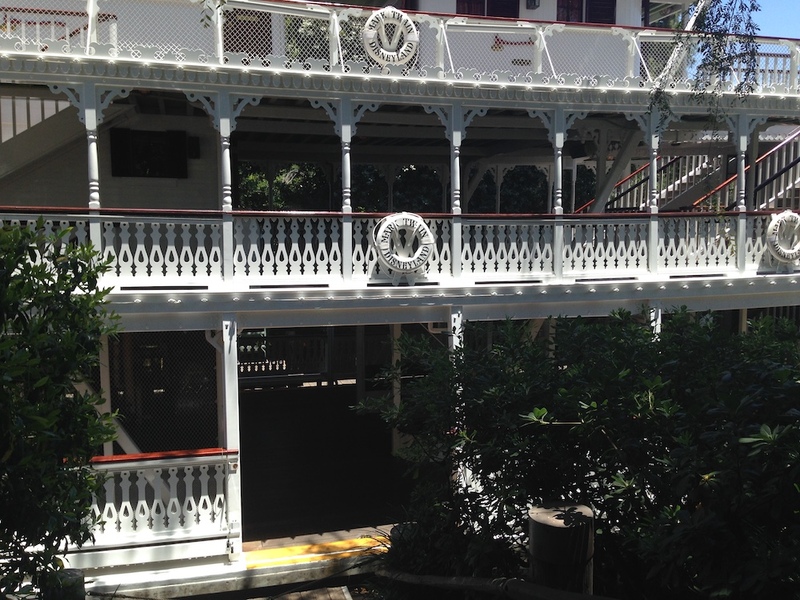 The MARK TWAIN has had a successful 61-year-career as a theme park attraction. The boat underwent a major refurbishment during the Spring of 1995, during which all the decks and the boiler were replaced. 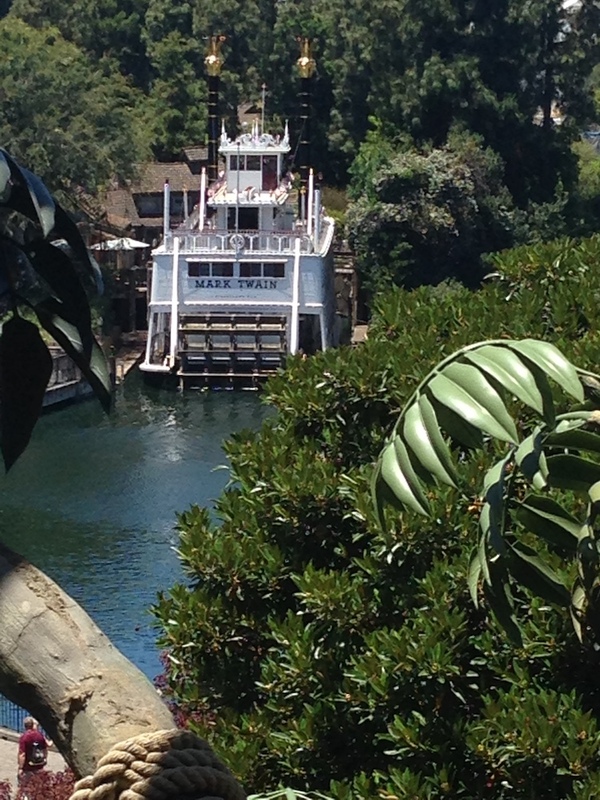 When the Rivers of America was drained in 2002, the boat was noted to have considerable hull damage. It underwent a refurbishment in 2004 to repair the hull, which included replacing the keel. For Disneyland's 50th Anniversary celebration in 2005, a new, more colorful paint job was applied. 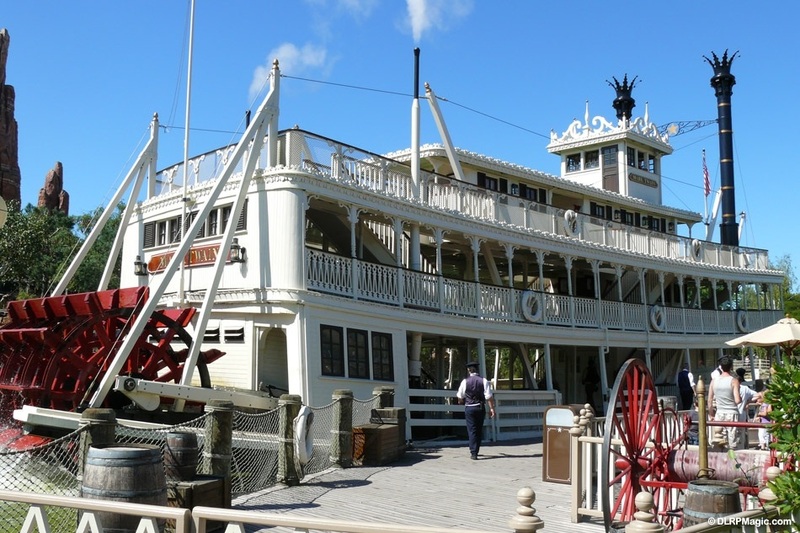 On January 11, 2016, the MARK TWAIN along with the other attractions and shows along the Rivers of America, were closed temporarily for the construction of a Star Wars-themed attraction. The original attractions are scheduled to reopen in July 2017. 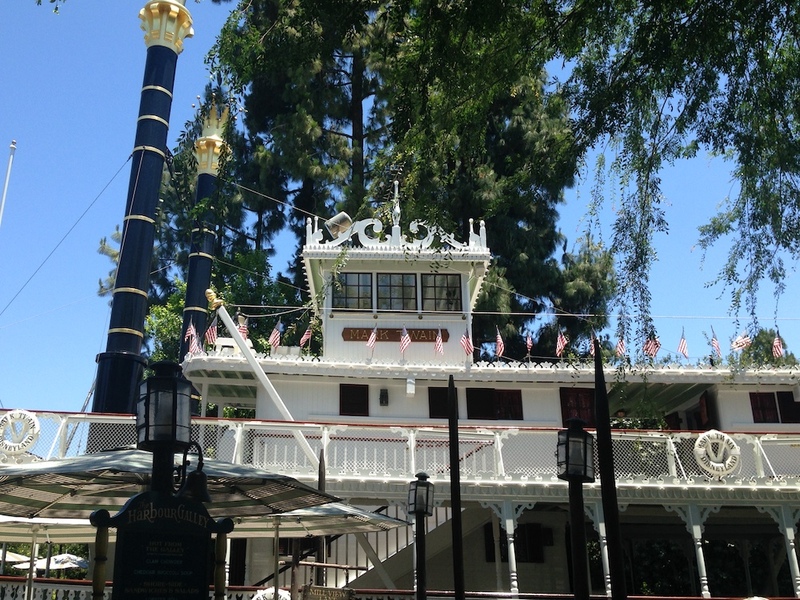 During this period the MARK TWAIN can still be boarded, with live music throughout the day and a television showing highlights from Disneyland's opening day. The queue area also features displays telling the history of the Mark Twain. The boat is also still fired up daily, and the whistle is blown at various points throughout the day. 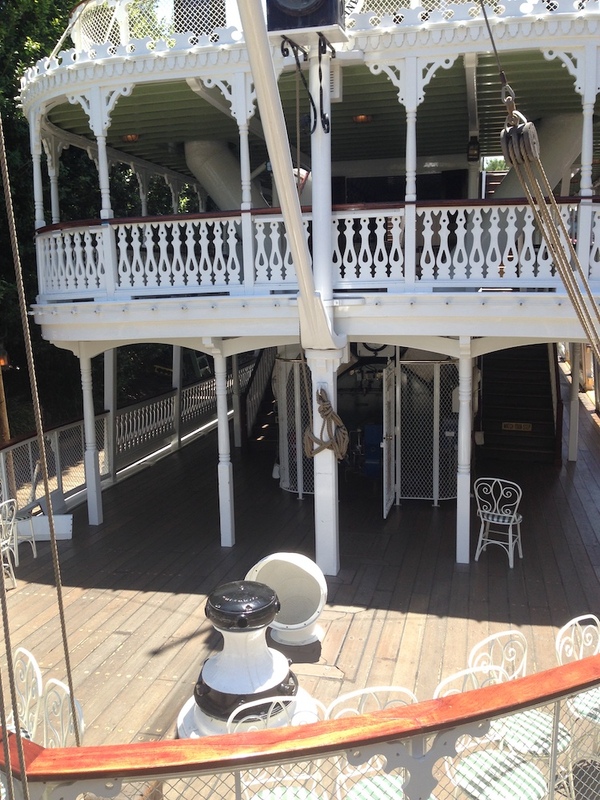 Here's one of the MARK TWAIN with its paddlewheel in view. Must have been taken in the mid '50's when Disneyland was new and the landscaping hadn't yet grown up and out to reach its verdant splendor. The water fowl swimming in the foreground must have been pleased with the pleasant waters of the Rivers of America. 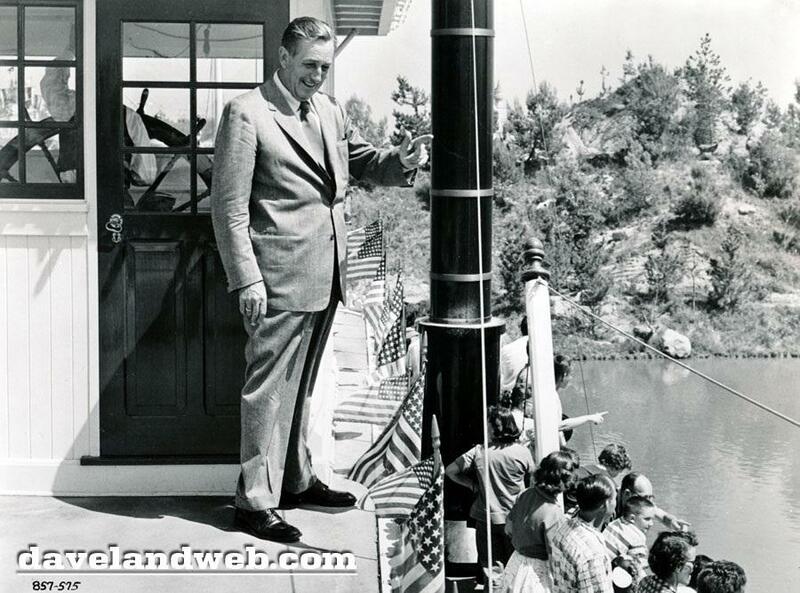 1955 . . . Walt Disney standing on the texas roof behind the pilot house of the MARK TWAIN nostalgia and history . 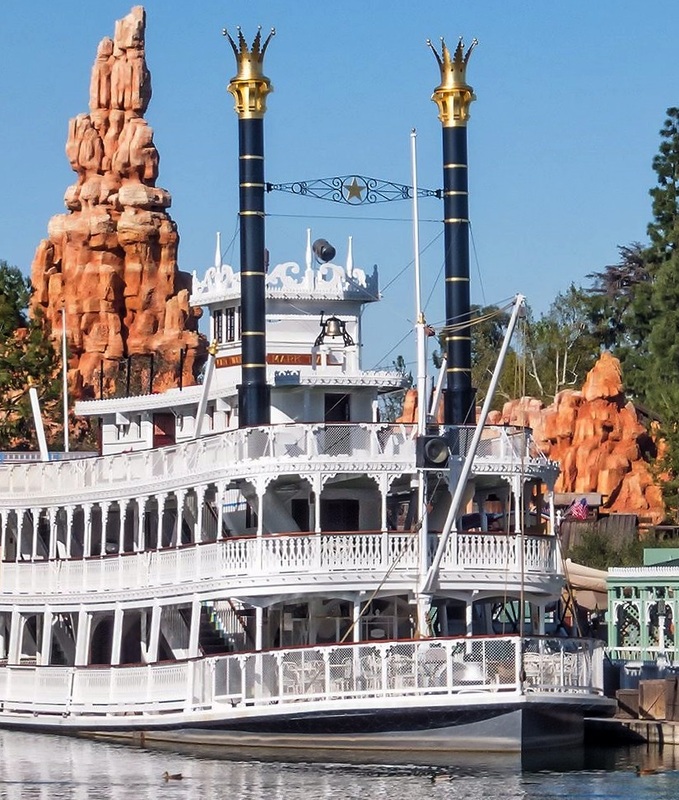 . .
Also attached a detail from a larger photo of the MARK TWAIN being spruced up for her return as a boat carrying visitors 'round the Rivers of America again. This summer, iconic Disneyland park attractions make their return with the reopening of "Fantasmic!," the Rivers of America attractions and the Disneyland Railroad. We know these classic attractions - many of which have delighted guests since the park's opening day - are very special to Disneyland park fans, and we are excited to celebrate their return. For 25 years, "Fantasmic!" has taken Disneyland park guests on a journey into Mickey Mouse's imagination, and its return on July 17 - in celebration of the park's 62nd anniversary - will bring new magic to this beloved nighttime spectacular! The treasured Disneyland park experience guests have loved for years, complete with its original fanfare and theme song, will be taken to brilliant new heights. New mist screens will combine with innovative, state-of-the-art projection technology for brighter and more vibrant visuals than ever before, and the show will feature new scenes inspired by Disney animated classics such as "Aladdin" and "The Lion King." 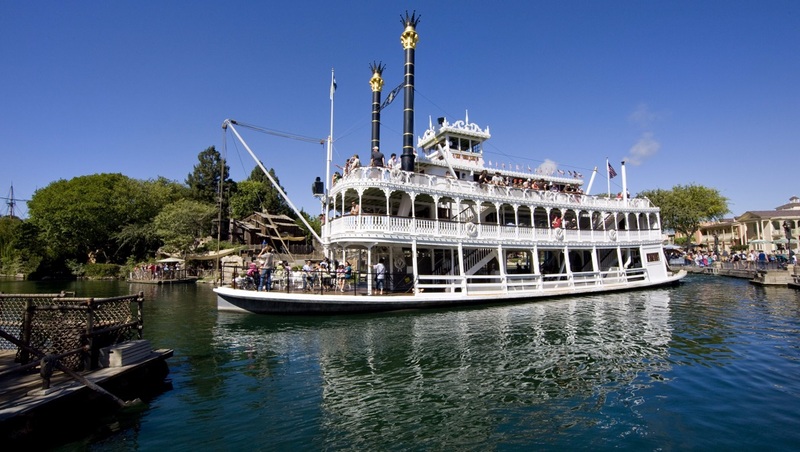 Also this summer, the classic Rivers of America attractions will reopen, starting with Pirate's Lair on Tom Sawyer Island this Friday, June 16, followed by Mark Twain Riverboat, Sailing Ship Columbia and Davy Crockett Explorer Canoes on July 29. For decades, guests have traveled the landscapes inspired by four of America's majestic rivers: the Mississippi, the Columbia, the Missouri and the Rio Grande; each carefully recreated, complete with indigenous rock formations, natural forests and wildlife. The return of these watercraft will bring even more breathtaking views for guests to discover, including an enhanced adventure featuring the new Columbia Gorge section, highlighted by five picturesque waterfalls. Last year, we shared the artist's rendering above, courtesy of Walt Disney Imagineering, showing the gorgeous new north bank of the Rivers of America, which will feature a beautiful new waterfront. This new waterfront will also include several elevated trestles over which the Disneyland Railroad will travel when it reopens along with the Rivers of America attractions on July 29. 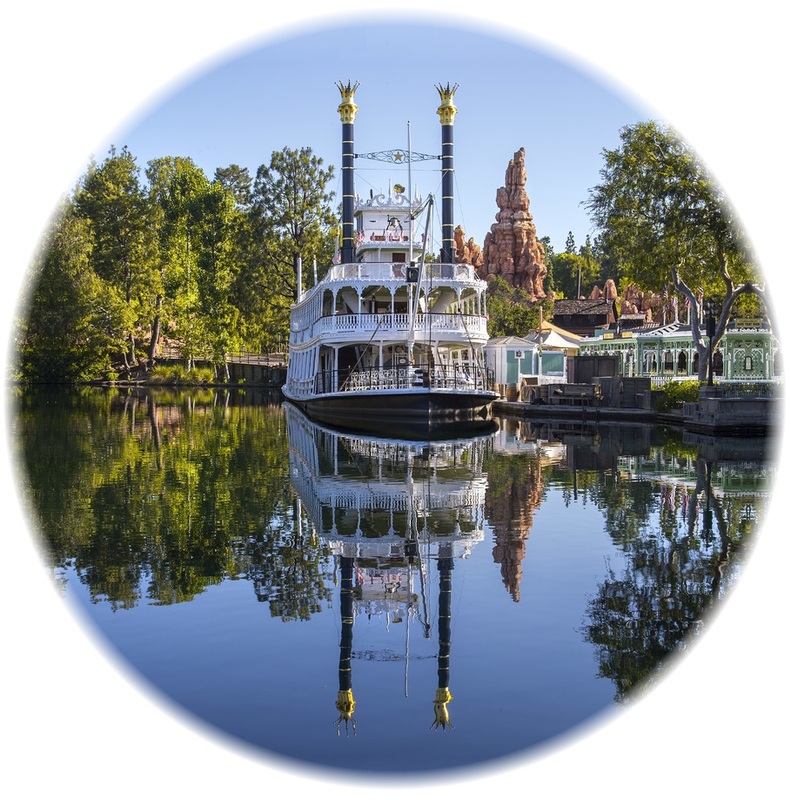 An icon for more than 60 years, the Disneyland Railroad holds a special place in the hearts of our guests, and we are excited to take them on the grand circle tour of Walt Disney's original Magic Kingdom once again. This classic experience will also feature new and enhanced adventures! For the very first time, the Disneyland Railroad will make a left-hand turn to continue around Disneyland park, and I'm excited to tell you that Walt Disney's legendary dioramas of the Grand Canyon and Primeval World have been carefully restored to their original splendor, with a bit of new magic added to both! Don't miss this iconic summer as some of your favorite attractions return to Disneyland park. Colors "pop" on this one. Must have been a fancy filtration unit attached to the lens to enhance colors. Always nice not to have distracting tourists in the picture. "New Orleans Square" in the distance. By stretching elements in the original photo top, bottom and sides I had enough to encompass a circle vignette of this dandy head on reflection of the freshened up MARK TWAIN standing by to go to work at the end of July. Almost forgot . . . current photo of pilot house with portside smokestack . 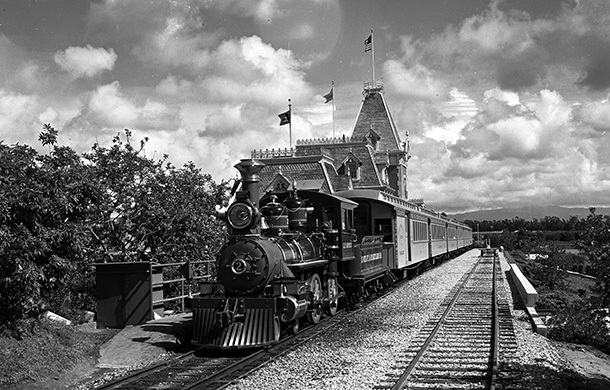 . .
After being closed for a year and a half, Disneyland sent the Mark Twain for a test run on June 8. It turned sixty-two on July 19, then started to carry passengers again July 29. 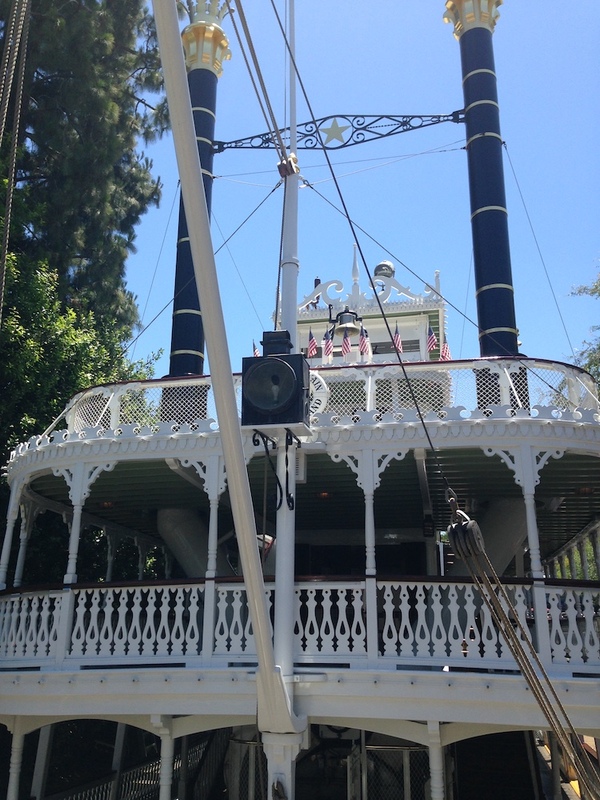 The Mark Twain runs on steam power that propels the paddlewheel. See the test run here: Youtube.